One could say this as a unique life cycle, and a phenomenon that makes the hills of Munnar a special place for biologists. The biological phenomenon of the mass blooming of the Neelakurinji (Strobilanthus) flower that takes place once in twelve years has once again arrived in the famed hill resort of Munnar. Neela means blue in Malayalam language and Kurinji the local name of the flower. For those in Munnar, the blooming of Kurinji flower is a reminder that their lives have gone past another twelve years, and for those from far off; may be it is reminder to witness a once in a life time rare sight of the Kurinji flowers covering the slopes and ravines of Munnar in a blanket of blue. The Kurinji flower, which last bloomed en masse in the year 2006, has showed up at some places around Munnar like Mattupetty and Top Station. Shortly, the slopes of Munnar hills would be blanketed by the Kurinji flowers, which would add yet another alluring charm to the sights and sounds of Munnar. Visitors to Munnar in the coming months can enjoy this marvelous sight, which is bound to leave an everlasting memory about this fascinating hill resort. Situated about 1600 mts above sea level, Munnar is well known for its vast expanse of tea plantations, cool weather, plantation bungalows and is blessed with a rich variety of flora and fauna. 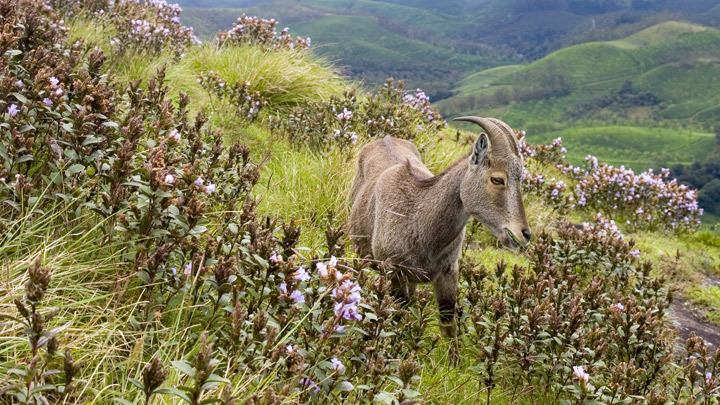 It is home to the majestic Nilgiri Tahr (Hemitragas hylocres), which is an endangered species. Over the year, good conservation methods helped it to thrive well in the Eravikulam National Park, located close to the town of Munnar. Close by is yet another attraction in the form of the Anamudi Peak, which is the tallest peak south of the Himalayas, and is an ideal spot for trekking. A visit to the Mattupetty reservoir and a boat ride in the adjoining lake is a delightful experience. Here, one may also visit the Indo-Swiss dairy farm, which houses some of the finest breeds of cows. Some other attractions in and around Munnar include some vantage viewpoints like the Top Station, which is the highest point on the Munnar-Kodaikanal rout; Marayoor, famous for its naturally existing sandalwood trees, Kundala, a picturesque town with a golf course maintained by the Tata Tea Company and the Pallivasal Hydroelectric project, which is the first such project in Kerala. Other nearby places of interest includes Echo Point, Chithirapuram, Anayirankal, Cheeyappara and Valara waterfalls. If for the first time, let Kurinji be your reason to embrace the mist-clad hills of Munnar. It is a place, where you would be tempted to scale heights that you never dared to; wet your feet in gurgling streams and rivulets, and care for a tête-à-tête with some of its unique wildlife, and even take a stroll among the plantations and take in the refreshing cool, crisp air.